Starring: Too many damn people to mention. 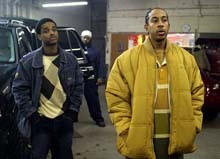 Oh, and LudaCris too! Right now, as I type this, movie reviewers are putting together their top ten lists for 2005. And without a doubt, the vast majority of those critics are adding Crash to that list. Many already have. So after these rave reviews, I decided to check out the little race-relations movie with the gigantic cast for myself. Frankly, I’m baffled. From the opening sequence, I could tell this was going to be crap. I’m convinced that movie critics are so afraid to go against what Hollywood preaches to us that they were compelled to give this film a top rating, despite the fact that it’s an ugly little movie whose strengths are overwhelmingly overshadowed by its weaknesses. I got hoes in different area codes. And yes, it does have its strengths. By far, its biggest strength is its cast. A huge ensemble piece that draws obvious comparisons to the work of Robert Altman or P.T. Anderson, there’s a ton of star power here. It’s a veritable who’s who of Hollywood talent: Don Cheadle, Matt Dillon, Jennifer Esposito, Thandie Newton, Sandra Bullock, Brendan Fraser, Chris ‘Ludacris’ Bridges, Ryan Phillippe, Terrence Howard, Larenz Tate, Keith David, William Fichtner, Marina Sirtis, and Loretta Devine are all in featured roles, and even Tony Danza shows up for a cameo. Every one of the players mentioned turns in a memorable performance, despite the fact that the material they’re working with is so mediocre. But I’ll get to that in a minute. Dillon, Howard, and Ludacris are the real standouts here, but everyone does a fantastic job. After that element, though, the weaknesses start showing. If I were rating this film on performances alone, it’d be among the best of the year, but I just don’t rate movies that way. First, let’s start with the obvious: the ‘message’. Crash is a story about a bunch of characters in Los Angeles that all happen to be racist. In fact, not only are they racist, but you are too. And so am I. And so is writer-director Paul Haggis. And so is everybody else in the world, we just don’t always realize it. This is the message of the film, and that alone isn’t enough to tank it. I mean, if that’s the filmmaker’s agenda, so be it. But rather than being subtly effective with this message, Haggis takes this opportunity to beat us all over the head with his motives. But, as you can imagine, it’s all great-white-hope pandering. Haggis, who cowrote Million Dollar Baby (and was the creator of Walker, Texas Ranger, for all you Chuck Norris junkies out there) but is behind the camera for the first time here, does nothing here that hasn’t been done before by a dozen other white filmmakers with a save-the-world fantasy. He tries way too hard to get his message across, and as a result, the film’s about as subtle as the third reich. Every scene in the movie is filled with examples of overt and implied racism, and every character seems like they’re forcing these feelings rather than actually believing them. There’s another huge flaw here, and it’s that the characters just don’t develop. Yes, the performers make the best of what they have, but it’s some pretty crappy material to work with. Character development to Haggis means establishing one extreme trait of a character and then turning them around 180 degrees as a result of one catalyst. Matt Dillon plays a racist cop who makes fun of his insurance adjuster’s “ethnic” name and torments a rich black couple one night, but after saving the same woman he tormented the night before, he suddenly realizes the error of his ways. The rich black producer played by Terrence Howard, who was also tormented by Dillon but breaks down and apologizes, suddenly becomes a vigilante after an argument with his wife. Dillon’s partner, played by Ryan Phillipe, has himself reassigned because he suddenly disapproves of his partner’s racism, but after picking up a black hitchhiker he completely changes his tune in the way that Dillon’s character had predicted. There are several other examples within this film, and every one seems completely unrealistic and forced. Of course, part of that flaw involves this being a movie that clocks in at under two hours. As a point of comparison, P.T. Anderson’s Magnolia had half as many characters but was almost twice the length. You’re just not going to build a dozen or more characters within an hour and a half and expect an epiphany that’s believable for one minute. The script uses dialogue that is completely unnatural. People have conversations that frankly just don’t happen, and if they do, they don’t happen this often with this small group of people in such a small amount of time. Of course, all the stories of these people intertwine in such a way that it just completely pushes the bounds of the whole movie coincidence thing. The whole thing comes off as hackneyed, preachy, and frankly pretty boring. Nothing really happens in the movie. Yeah, people act all racist and then have their little epiphanies, but they don’t really do anything interesting enough to merit a movie being made out of it. The result is a movie that’s not about anything but a message that we’re contantly flogged with for 113 minutes. And yet, critics all over the mainstream are eating it up like a hearty meal. My theory is basically that major critics are afraid to go against something which is perceived as being so important and responsible, despite the fact that it’s really not that well-made a film. Not surprisingly, the reviews pretty much either seem to either fall into the “loved it” or “hated it” categories, although the former far outweighs the latter. You may fall into that category as well, but be not fooled by Hollywood snake-oil salesmen, and take this film with a shaker of salt. I loved this movie and showed it to my boyfriend ( an aspiring Director) and he felt the same way as you. I think the problem was, with him anyway, a misunderstanding of the music. You and him thought that the Dillion had a complete turnaround at the end. There was nothing in the movie to suggest that! All he did was save a black woman – which is his job. My boyfriend said it was the music that suggested his turnaround… I dont agree. Anyway, I think the performances were enough to make me love this movie.